Epilepsy is one of the hardest illnesses to treat. It is possible to prevent seizures and to cure some forms of epilepsy. I believe I have found a way to stop all non tumor and non infectious seizures once and for all. To explain this we have to begin with the actual cause of ALL seizures not related to tumors or infections. The main cause of a seizure event is oxygen deprivation. Once oxygen levels drop in the brain electronic signals are sent out causing a seizure. Eventually the brain believes a seizure is a normal brain function and tries to perfect the seizure function. This action from the brain develops longer and sometimes more intense seizures. So now that we know what causes a seizure, how do we control them or eliminate them altogether? If your pet's seizures are escalating, you may want to get rule out tumors or infections. This can be done through an MRI and spinal tap. This will eliminate them as a source of seizure activity. Do not rush into this procedure because it is a very dangerous and can potentially cause increased seizure activity which ultimately could kill your pet. If you believe your pet does not have a tumor or an infection, follow these 8 steps for healing. Do not attempt to reduce your pet's seizure medication until they have been seizure free for at least 3 months. Then slowly try to tapper your pet off the seizure medication. If your pet is on more than one medication start with the most hazardous medication. Wean one medication at a time. The recommend removal rate is 20% each week for the first 4 weeks then reduce the last 20% every other day for 1 week then stop the medication. If your dog has any seizures during your withdrawal attempt immediately put him/her back on the last dosage prior to the seizure. If no additional seizures occur, try the medication reduction again in 4 weeks. If seizures continue increase medication dosage until seizures have stopped. VERY IMPORTANT: Keep in mind nearly ALL epilepsy medication is generic. There are literally hundreds of labs that produce seizure medication. Make sure you find out what lab you are getting your current medication from. If the pharmacy switches labs without your knowledge your pet could have a very sever reaction causing serious seizures. Each pharmaceutical lab produces medications differently with different ingredients and fillers. If you have a medication that is working well fro your dog do NOT switch manufactures. Buyer beware!!!!! Peoples Pharmacy compounds their own seizure medications for pets and people. I highly recommend them for any generic drug you want to make sure does not come from a third world country. USA Today reported that over 30% of the generic drugs we get from pharmacies are counterfeit drugs not made by the labs selling them. THAT is VERY Scary! 1. Most epileptics are dehydrated. Did you know that dehydration can cause seizures? Yes, it can and does. This is the first line of defense. Hydrate your pet. If you place your finger on the inside of your pets gum and in feels sticky your pet is dehydrated. Electrolytes are very important for hydration. They hydrate better than plain water. You can give these to your pet through fresh coconut water, pedialyte or add 1 teaspoon of fresh lemon juice to your pets water. This will not only hydrate them it will kill bacteria, keep there veins and arteries clear of plaque and eliminate any gallbladder or kidney stones. You pet needs 1/2 of their body weight in purified water or fresh coconut water each day. That means if your pet weighs 40lbs you must drink at least 20oz of purified or distilled water each day. NEVER give an epileptic dog tap water. 2. Additional oxygen or Clean air is important. Oxygen levels in the past years have dropped from 30% to 20%. That is a huge drop. You and your pet's body may be oxygen deprived. Oxygen is important for healing. Ask your doctor to give you a prescription for an oxygen condenser. (this is a machine that makes 95% oxygen out of air) You can use it without a nasal tube. I put my machine on without the tube and close the doors in that room. I let it run for about 4 to 5 hours, 2 to 3 times a week. This saturates the room with rich oxygen you and your pet can breath in all night long. If this is not an option for you, purchase a top of the line air purifier. Place the purifier in the room your pet is located in. Large doses of Vitamin A can cause the brain to swell. Vitamin A is fat soluble so in builds up in the body. Liver has 6500iu per 3.5ounces. That is almost 10 times the maximum daily dosage. Never give a dog cod liver oil. Pet food manufactures are notorious for adding chicken liver to just about every dog food on the market. Read EVERY INGREDIENT on the label of any food you are giving your dog. Folic acid renders seizure medication non-effective. Also do not give your dog any vitamin that contain folic acid. Add coconut oil or flax seed oil to your pets diet. At least 1/2 teaspoon a day. Keep dogs away from these poisonous foods and poisonous plants. Give 4 small Curing Pill pellets. This will help settle the dogs stomach. Immediately give the dog 1 (Natures Way) Charcoal capsule (2 if the dog is large) mixed with plain yogurt or cream cheese immediately. Charcoal only works on the amount of poison that has not yet been absorbed by the pets' body so the sooner you can get this into your dogs system the more poison the charcoal will absorb. This is the first thing the emergency vet will do so it is better if you do it at home rather than waiting for 20 to 30 minutes to pass. If you are able to get the dog to eat the capsule make sure to follow it with 3 oz of fluid. Do not try to shove the capsule down their throat. If they refuse to eat the charcoal, syringe the mixture into their mouth. (ALWAYS point the syringe to the side of the mouth never to the back) Pointing the syringe to the back of the mouth can aspirate the dog (get fluid into the dog's lungs) which can cause death. Give your dog 4ml of 100% Source Naturals Cherry Juice and one Acidophilus Pearl. This will help keep the kidneys from failing. 4. Buy the book Diabetes Diet. It will teach you what foods and oils are good for you and your pets as well as what foods and oils should be avoided. 5. Give your pet a good multi-vitamin and a good joint vitamin. I like the Pet Naturals brand. Make sure it does not contain a large amount of folic acid. Give your dog at least 250mg of Ester C each day. 6. Give your pet Nuroplex pills. You may be able to reduce or eliminate your pets medications by using this product. Start off with 3 pills twice a day. If you pet's seizures have not stopped after 7 days add 1 pill to each serving. If your pet's seizures have not stopped after 3 more days add one more pill. Keep going until the seizures have stopped. You can buy these at www.allergicpet.com the man who invented this product originally made it for pets but it works great on humans too. 7. DO NOT give your dog flea medication. If you feel you have to give flea protection, use only Front Line flea medication. This is the only flea medication found not to spark seizures in pets with epilepsy. 8. Use ONLY Tri-Heart Plus heart worm medication. This is the only heart worm medication found not to spark seizures in pets with epilepsy. Unfortunately, dogs that have seizure issues run the risk of many health problems from their medication. Poor nutrient absorption, bacterial infections, poor circulation, dehydration and the list goes on and on. I have found a way to eliminate bacterial and viral infections, parasites and worms and a vast array of other health issues. It is through the use of food grade H2O2. You can purchase diluted food grade h2o2 at your health food store or online. Mix 3/4 of an ounce of the diluted version to one gallon of purified or distilled water. Give this water to your pet. Not only will it boost your pets immune system, it will pH balance their body, eliminate bacteria and infection and eliminates gingivitis and tooth plaque. WARNING: DO NOT take folic acid, endosorb, milk thistle or dandelion when on seizure medication. Do not take calcium or foods with large amounts of calcium 2 hours before or 2 hours after seizure medication. These supplements will render your medication ineffective! Those Taking any Anti-convulsant drugs Phenobarbital, Phenytoin, Dilantin, Primidone, Mysoline, Carbamazepine, Valproic Acid, Keppra, Neurontin, Trileptal, Klonopin, Clorazapate, ect, ect . In addition to folic acid, dandelion, milk thistle and endosorb those with seizures should avoid the below mentioned herbs or vitamins. v Borage and Evening Primrose Oil should not be used with anticonvulsants because they may lower the seizure threshold. v Folate (Folic Acid) may increase seizures in individuals with epilepsy and may interfere with phenytoin therapy. v Ginkgo components may decrease the anticonvulsant effect; avoid concurrent use. v Ginseng may provide an additive anticonvulsant action (theoretical). v Glutamine Theoretically, high doses of glutamine may overwhelm anticonvulsant drugs and pose a risk to individuals with seizure disorders because many of them work by blocking glutamine stimulation in the brain. v Hawthorn may increase the sedative effects of CNS depressants such as barbiturates; avoid concurrent use. v Kava taken with barbiturates may result in increased sedation. v Lemon Balm may increase the sedative effects of barbiturates and CNS depressants. v Magnesium can interfere with absorption of phenytoin. To avoid this problem, magnesium should be taken at least 2 hours before or after anti-convulsant drugs. v Sage may decrease the action of anti-convulsants; avoid concurrent use (theoretical). v Scutellaria baicalensis may increase sedation of CNS depressants; avoid concurrent use. St John's wort interacts with a number of medications and herbs used to treat epilepsy. v Valerian may increase the effects of CNS depressants; avoid concurrent use. v Vitamin B3 (Niacin) might increase serum levels of anticonvulsant medications including carbamazepine and primidone, possibly requiring reduction in drug dosage. White Willow May interact with epilepsy medication. Coco is my dog. She contracted encephalitis 11 days after she was vaccinated with the Pfizer Distemper - Parvo Lot # A062110 . She was born on 5/31/11 the shot was given on 7/28/11 and she contract encephalitis on 8/7/11. She was about 8 weeks old. The encephalitis caused a high temperature 105.3 and caused her brain area to swell causing brain damage. The brain damage began caused her to have seizure outbreaks. I explained to my vet that my dog was perfectly fine before they gave her this vaccine. She was running and playing with the rest of her siblings. There was absolutely nothing wrong with her. After the vaccine she developed encephalitis and almost died. My vet assured me it had nothing to do with the vaccine. Later October 2012 I found out that was not true. Distemper - Parvo Vaccines have been causing encephalitis for years. NEWSFLASH: The supreme court ruled that drug companies can not be sued for vaccine related illnesses or death in humans. There isn't a place to file a pet vaccine reaction or death report. Pet vaccines are regulated by the FDA yet they do nothing to police vaccine related sicknesses or deaths. Fortunately, Coco lived through the encephalitis ordeal and was put on seizure medication. After about 1 month on Phenobarbital Coco began having break through seizures. I started investigating natural methods. I first stared using Pet Alive's Easesure. That worked for a while but then she started having seizures again. About 2 months later I found allergic pet's Nuroplex pills. I put Coco on 4 pills twice a day. It worked great she did not have any seizures for over 2 months. Austin Vet Care and Texas A&M wanted me to do an MRI and spinal tap on Coco to find out if she had an ongoing infection and what was happening with her brain. I agreed to have the MRI and spinal tap done by Texas A&M on 2/29/12. I was told to stop the herb pills because they might interfere with the medication needed to put Coco to sleep. I stopped giving her the Nuroplex pills. This proved to be the biggest mistake. After a few days Coco's seizures returned. I had a very hard time controlling them. I used all the valium the Dr. Joycelyn Cooper had given to me. I brought Coco back to Texas A&M to get Coco's seizures under control. I had not started her back on the herb pills because I thought the new medication she was on should be working. I left her for 2 nights at Texas A&M. That was a huge mistake. When I picked up Coco she was screaming and was blind. I asked Dr Cooper what she did to my dog. She replied, Oh it's just the medication or maybe she is happy to see you. I told her Coco had never acted like that. Also, her legs were full of pin marks. She had a total of 32 pin marks on her legs. It was crazy. She regained her sight 3 days later. On the way home, Coco was screaming and crying for over an hour and a half. I wrote the school a letter regarding what happened. I asked them to investigate the incident. They never did any kind of investigation. They only wrote me a later stating they were glad Coco was doing better. What a joke. To this day I have no idea what they did to my dog. She started having seizures in the car. The new medications obviously were not working. When I originally picked her up from the MRI and spinal tap on 2/29/12 she was fine. She was not screaming and she could see. On the second visit 3/11/12 they returned Coco to me in a horrible state. She was worse off then when I brought her. If I had known what they were going to do to my dog I never would have brought her back to Texas A&M. I promptly took Coco to a nearby vet hospital Austin Vet Care. They started her on a valium drip and seizure medications. The new vets began talking with Dr. Jonathan Levine (the head neurologist at Texas A&M.) Dr Levine directed them to put Coco on 6 more anti seizure medications. NONE of the new drugs were controlling her seizures. 7 days later she was having seizures every hour. The hospital told me they were running out of valium and would have to take Coco of the valium drip in 4 days. Dr Jonathan Levine told me he would help with any medication Coco needed that she could not get from the vet hospital. I emailed Dr Levine and asked him to contact the hospital to arrange for additional valium to be sent for Coco case. He told me NO, he now could not help with any medication for Coco. Thanks Dr Levine for NOT helping Coco in her time of need. In a last ditch effort to save Coco, I asked the Heart of Texas pet hospital if the had valium and they said they did. That night at 11pm I brought Coco to the Heart of Texas hospital. They were so professional they immediately began working with Coco to try and control her seizures. After 5 days they were unable to control Coco's seizures they told me at some point they would have to try and wean her off the valium. I asked them to begin giving Coco the Nuroplex herb pills that had worked for her before. They did and within 4 days her seizures had completely stopped. Thank God! I brought Coco home on 3/25/12. Coco had 3 more minor seizures at home the first 2 days and has not had a seizure since. I called Dr Levine and asked him if he would help me wean Coco off some of the harmful medications, he refused and told me to talk to my vet who then told me to talk to the neurologist. What a racket....No Doctor wanted to help me get her off all these meds that were damaging her liver and kidneys. NO one wanted to really help me save Coco. They all kept telling me to put her to sleep. I am currently weaning Coco off ALL 6 medications Dr Levine put her on and I am happy to report Coco is SEIZURE FREE!!!! Unfortunately, most doctors only know one way to help people and that is with medication. When the medication stops working, they want you to kill your pet. They will NEVER tell you how to use natural methods, because they don't know how to use them. If you or a loved one has seizures buy the Nuroplex pills today! They worked and Coco is living proof. ALL the doctors said she would not make it but she did. I give thanks to God for showing me the importance of these herb pills for Coco. I hope this story encourages and helps give you hope. You can stop your seizures naturally. We finally got Coco off all the medication except for 3 medications. My local vet Dr. Chloe helped me with Coco's care. She provided me with all the medication and Valium Coco needed in case of an attack. At the beginning of June, Coco began having very bad seizures lasting more than 25 minutes. The veins in her legs were so messed up from the hospital visits and Texas A&M using her for a pin cushion, the doctors had a very hard time finding a vein to give her propofol. We then decided to give her valium instead of propofol. I was giving her close to 50mg of valium a day. On June 11, 2012 we made the hard decision to put Coco to sleep. We believe she had a brain aneurysm or a stroke. In any case we lost the fight to save our baby. I hope you have better luck with your pet. If I would have waited to vaccinate her, maybe she would still be with us. 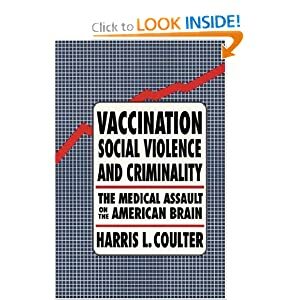 Vaccination solcial violence and criminality: The medical assault on the American brain by Harris L. Coulter Ph.D.
Coulter talked about encephalitis having physical, neurologic, mental, and emotional symptoms. A variety of syndromes can occur because any portion of the nervous system can be affected. This applies to our pets as well as our kids. Vaccinations may even contribute to premature death in animals whose immune systems were already comprimised, some veterinarians believe. "I had two situations where we had spent a long time building up two older, severely immune - compromised dogs, and then their owners had them vaccinated for just about everything known to man," recalled Dr. Carvel Tiekert, executive director and founder of the American Holistic Veterinary Medical Association headquartered in Bel Air, Maryland. "Both of those dogs died within about a month of vaccination. Can we prove a cause and effect? No. Do I think there was a cause and effect? Yes." Epilepsy is listed by Merck as a symptom of encephalitis, and we know that encephalitis can be vaccine-induced. Merck states: “noninfectious causes of encephalitis include … vaccine reactions: many”. It adds that epilepsy can be caused by “CNS infections (meningitis, Aids, encephalitis) and also by a foreign serum or drug allergy, or by convulsive or toxic agents”. See also Ballerini, Rico B et al., Neurological Complications of Vaccination With Special Reference to Epileptic Syndrome (Review Neurol, Jul-Aug 1973; 43: 254-258).